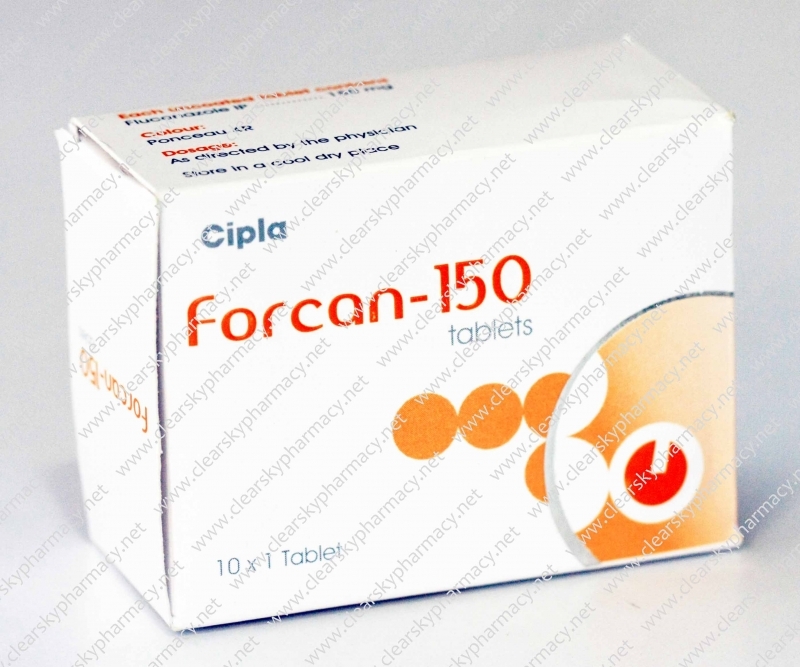 Forcan (Fluconazole tablets) is used to treat yeast and fungal infections including meningitis as well as to prevent yeast infections in patients undergoing chemotherapy and radiation therapy prior bone marrow transplantation. Generic Diflucan (Forcan tablets by Cipla) treats many types of yeast infections including vaginal infections, mouth infections, throat infections (esophagus pipe), abdomen infections, lung infections, blood infections, and other organ infections. At our online pharmacy, we stock Generic Flucaonazole in strengths of 150 mg and 200 mg.
We also have in stock Generic Lamisil Tablets (Terbinafine Hydrochloride tablets) which are used to treat Fungal infections of the skin, which includes the treatment of tinea corporis, tinea cruris, tinea pedis, and yeast infections of the skin caused by the genus Candida where oral therapy is generally considered appropriate. We supply original Forcan tablets in strengths of 150 mg and 200 mg manufactured by Cipla, Ltd. India. The active ingredient present in Forcan tablets is Fluconazole. Each uncoated Forcan tablet contains 150 mg or 200 mg of Fluconazole respectively. 1. Vaginal candidiasis: (vaginal yeast infections due to Candida). 2. Oropharyngeal and esophageal candidiasis: In open noncomparative studies of relatively small numbers of patients, Generic Diflucan was also effective for the treatment of Candida urinary tract infections, peritonitis, and systemic Candida infections including candidemia, disseminated candidiasis, and pneumonia. 4. Prophylaxis: Generic Diflucan is also indicated to decrease the incidence of candidiasis in patients undergoing bone marrow transplantation who receive cytotoxic chemotherapy and/or radiation therapy. Fluconazole is a highly selective inhibitor of fungal cytochrome P-450 sterol C-14 alpha demethylation. Mammalian demethylase activity is much less sensitive to Fluconazole inhibition in comparison with fungal demethylase. The subsequent loss of normal sterols correlates with the accumulation of 14 alpha-methyl sterols in fungi and may be responsible for the fungistatic activity of fluconazole. Fluconazole is mainly fungistatic; however, it may be fungicidal against certain organisms in a dose-dependent manner, specifically Cryptococcus. As with any medication, you should take Cipla Forcan (Fluconazole) at the same time every day or you would otherwise have peaks with high or low levels of the medication in your body. This way you obtain the highest efficiency of the medication and maintain a constant level of the active ingredient being absorbed into your body and blood stream. You are also likely to experience less potential side effects. If a medication is prescribed to be taken twice daily in the morning and evening then try to take the dosage exactly 12 hours apart. If you forgot to take Generic Diflucan tablets then take it as soon as possible. However, skip the forgotten dosage if it is almost time for your next normally scheduled dose as you should never take double dosage even if you forgot your medication for several days. Taking a double dose or taking two doses within a short period of time may increase side effects and other health risks while there are no increased benefits. You should take Cipla Forcan (Fluconazole) by mouth with or without food. If you are on proton pump inhibitors such as omeprazole then you must take Forcan tablets (Generic Diflucan) at least 2 hours prior taking these. Take 200mg the first day followed by 100 mg once daily for 7-14 days. Take 200mg the first day followed by 100 mg once daily for 21 days. Take 400mg first day and then 200mg once daily hereafter. Generic Diflucan is contraindicated in patients that have hypersensitivity to Fluconazole, medicines related to Fluconazole such as Miconazole, Ketoconazole or Clotrimazole, or any inactive ingredient of this medicine. This is not an exhaustive list of all potential side effects of Cipla Forcan (Fluconazole Generic) and you may experience other side effects. It is, however, the most commonly known side effects. If you experience other side effects that bother you then contact your doctor or pharmacist and explain the symptoms in detail. They may be able to help you. Forcan tablets manufactured by Cipla may not be safe or suitable for all patients and you may need dose adjustments to get the optimal level of the active ingredient. Always make sure to tell your doctor if you are pregnant, if you intend to become pregnant, or if you are breastfeeding. You must inform your doctor about any and all medication you are currently taking of has been taking within the last month. This includes prescription medication as well as non-prescription medication (commonly known as OTC or Over-The-Counter), herbal medication, vitamins, and other health supplements. Do not start on a new medication without consulting your doctor or pharmacist about potential drug interactions. Your doctor or pharmacist also needs to know about any allergies you have and if you have other illnesses or medical conditions. Do not take Cipla Forcan Tablets (Fluconazole Generic) if you are allergic to any of the ingredients in the tablet or if you are currently taking astemizole such as eplerenone, cisapride such as ergotamine, pimozide such as eletriptan, or terfenadine, rifabutin, tacrolimus, omeprazole. 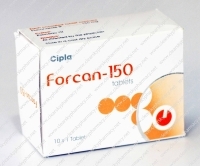 You can buy Forcan tablets (Generic Diflucan) online from Clear Sky Pharmacy. Forcan 150 mg and 200 mg pills, manufactured by Cipla Ltd., India are supplied in a blister pack of 1 or 4 tablets. 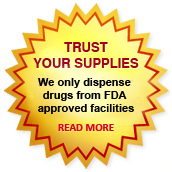 The 150 mg tablets cost only $3.75 per unit when you place an order for 24 tablets.